“Pomegranates, khachkars, statues, different bowls and jugs—each class we try to craft something new, something innovative. 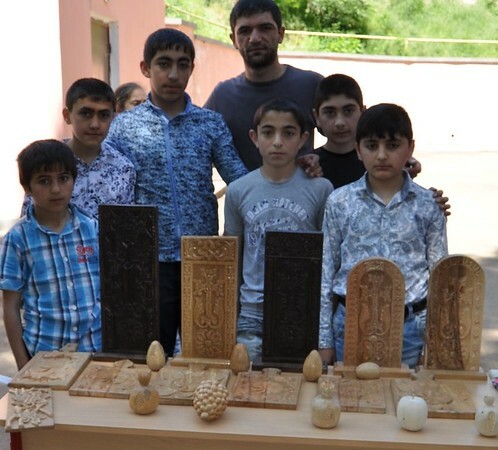 I try to be encouraging and tell my students the old saying that a man who knows how to work with his hands will never go hungry,’” said Sargis Ghevondyan, 24, who has been teaching woodworking in the rural border village of Chinchin for the last four years. The extracurricular course is made possible by FAR’s Breaking the Cycle of Poverty Program (BCPP). Encouraging children’s creativity through courses in painting, handicrafts and woodworking has been the crucial focus of the extracurricular groups established as part of BCPP. Since 2014, 10 boys between the ages of 14 and 16, have diligently attended the woodworking group twice a week. The class is the only one of its kind currently offered through BCPP and is open to boys and girls throughout Berd. Besides sponsoring the after-school groups, FAR has also renovated and refurbished eight technology classrooms in Berd City, Verin Karmiraghbyur, Choratan, Chinari, Aygepar, Movses and Chinchin villages through BCPP, all of which are used as space for the extracurricular groups. “Most importantly, these children have an interesting hobby that they can pursue. In this period, they have gained life skills that can be useful to get ahead. Besides wood crafting itself, they have also learned how to create designs on the computer, which they later etch in wood. In fact, these children have become so interested in this hobby that they are reluctant to focus on their schoolwork,” joked FAR’s Education Programs Coordinator Eduard Karapetyan.